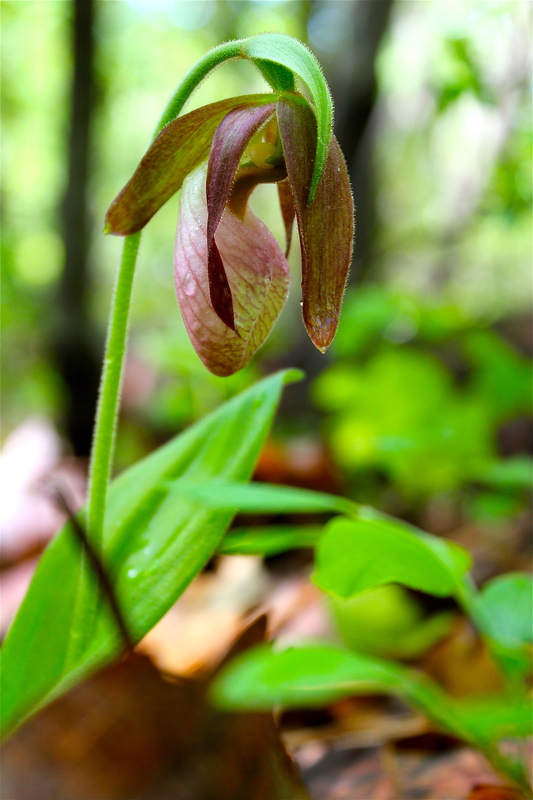 One of the showiest orchids in our local forest, the pink lady’s slipper appears between May and July. Before it flowers, you may notice the leaves lying quietly on the forest floor: there are usually just two of them, and strong parallel veins are evident on the oval leaves. When the flower opens, the color can be variable, from light to dark pink or even magenta. This plant grows 6 to 15 inches tall. As attractive as this flower is, don’t try digging it up and taking it home. The plant is difficult to grow and requires the symbiotic interaction of a soil fungus (Rhizoctonia) in order to thrive. These orchids were photographed in June on Brush Mountain in Montgomery County, at the Mountain Lake Conservatory in Giles County, and on the Potts Valley Rail Trail. If you find something similar, but in a yellow color, see Yellow Lady’s Slippers. I know I got carried away with this gallery, but these are fascinating subjects for the camera 🙂 ! A brand new Lady’s Slipper about to open. This one was found on May 9th at Pandapas Pond. Hi Gloria, We just moved to Nickelsville, VA from NH. My aunt LOVES Lady Slippers. We love to go looking for them and taking their pictures when she visits me. I am wondering if you can tell us some areas near me that may have these beauties. We would love to keep up our tradition. I would greatly appreciate your help. Please email me if possible. Thank you.